Computer, Filter and Many Others. 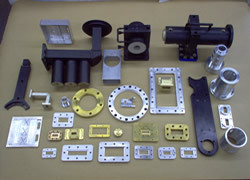 In addition to our machining of precision parts to customer specifications and drawings, we specialize in the manufacture of microwave flanges. By using our large inventory of various size broaches, we are able to make a great variety of these flanges both standard and special, including the ultra-small millimeter sizes. 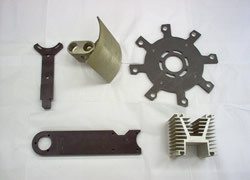 We also have complete facilities for aluminum dip brazing and heli-arc welding. In order to completely service our customers, we utilize the services of outside processors for metal finishing, heat treating and testing, etc. The outside processors used by us are those whose service and quality are excellent and are being used on a major scale by the many electronic, microwave and electromechanical firms in the area.